Training on 5th July – 10th July 2010……………………. 5th July saw the second batch of trainees undergoing the program. The idea of having the interviews for selection before training was prudent because we saw serious farmers who were prepared to pay the price of hard work. If not we will not be able to see the results if committed farmers were not chosen. The 6 days training also saw them spending most of the time in the field, hands-on. 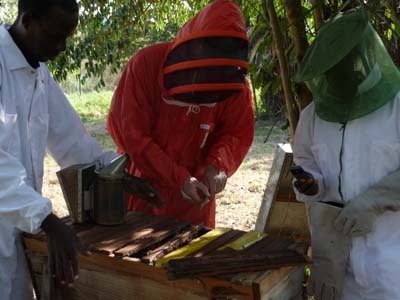 By the end of the training, we received very positive feedbacks especially having them recognizing the importance of real field experience rather than classroom lectures of honey farming throughout the course. We had a very interesting participant and we shall talk more about him later in the blog. Our classes were kept to a maximum size of 12 and below. We do not want classes to be of any larger less it might cause stress to the bees if activities were to be conducted throughout the next 6 days. African bees are well known for its aggressive behaviour. The classes will not meet its objective if the farmers were unable to work on them when they turn aggressive. The class started with the participants introducing themselves and sharing with all why did they decide to embark on beekeeping. This gesture is common here and I do find it is a good practice. It will somehow enable the participants to interact more freely and to share their experiences as we went along. 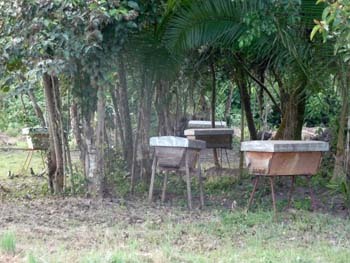 Different types of hives were shown to the farmers in order for them to have a better understanding. 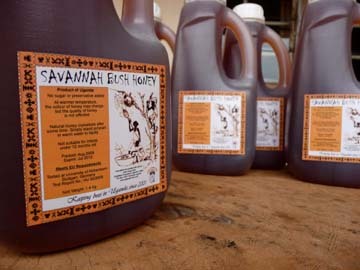 Most farmers are still unaware of the different types of bee hives that can be used for honey farming. 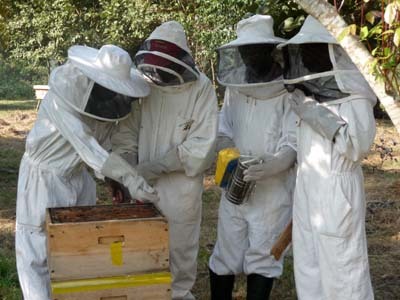 The course provides the insight of the history of beekeeping, the different methods applied in different parts of the World, the advantages and disadvantages of the various hives used. Most important of all the migration of honey hunting to honey farming. 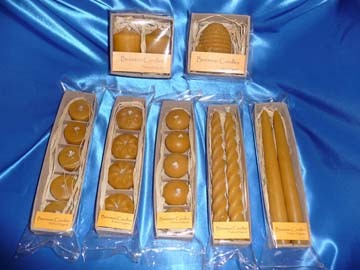 One of the first topic that we had touched on was sustainable beekeeping. It is pointless if we would just simply teach them about beekeeping without them realizing how to keep the business sustainable. We need to instill in their thoughts that the most productive method is the method that will suit them best, in terms of financial and skills. Beekeeping is a full time job. 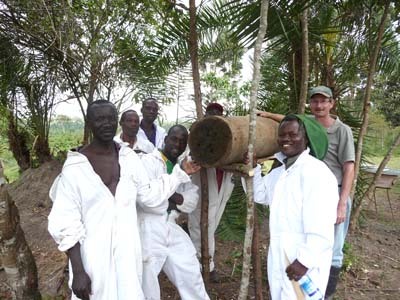 We have to change their mindset that beekeeping is not easy and simple. You don’t simply put beehives out in the field and wait for the honey flow season to starts. After which you go and collect the honey and sell. All these have to go. When there are no interaction with the bees, you will see zero results. When the time comes for harvesting, they would find the colony so aggressive, so much so that instead of harvesting honey, they would destroy and kill all the bees before they can to get to the honey. The fear of these insects was always there and the only method they knew were to approach them during the night with fire to avoid stings. That was what they were taught from their parents and grand parents. 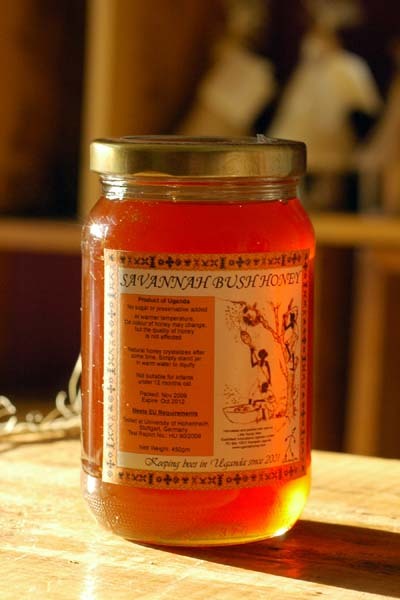 The end results – beautiful honey destroyed and contaminated during harvesting. They were quite skeptical in the beginning when we told them they will be moving into the apiary in the afternoon. We will work on the bees in broad daylight. Some did not believe it. In order for them to accept the fact that beekeeping can be done during the day, we went down to the apiary and let them have a feel of the bees busy flying in and out of their hives. 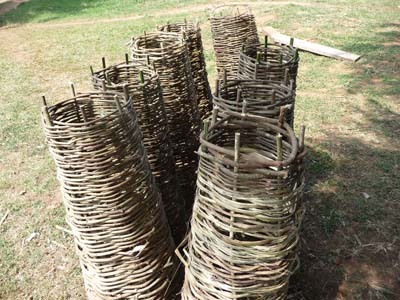 Hives were neatly placed with short, trimmed grasses for easy mobility and management. 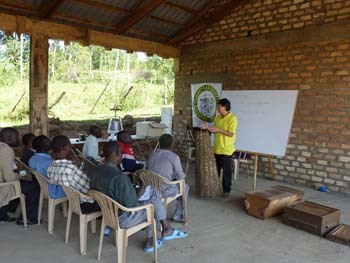 The following day, the team started early to begin their basic on apiary management. Previously some were taught that they were supposed to hide their beehives among tall grasses because bees loves to colonized in thick bushes. This is not true. In fact having all the tall grasses and thick bushes would hinder the mobility of the farmer. On top of that, farmers can even be injured or killed by snakes hiding or moving around. Thus we demonstrated why it is important to have a clean neat apiary for easy handling of the hives during apiary management. Every batch will be taken to task to start an apiary from scratch. We allocated another part of the farm to have them clear the area to prepare the siting of their bee hives. 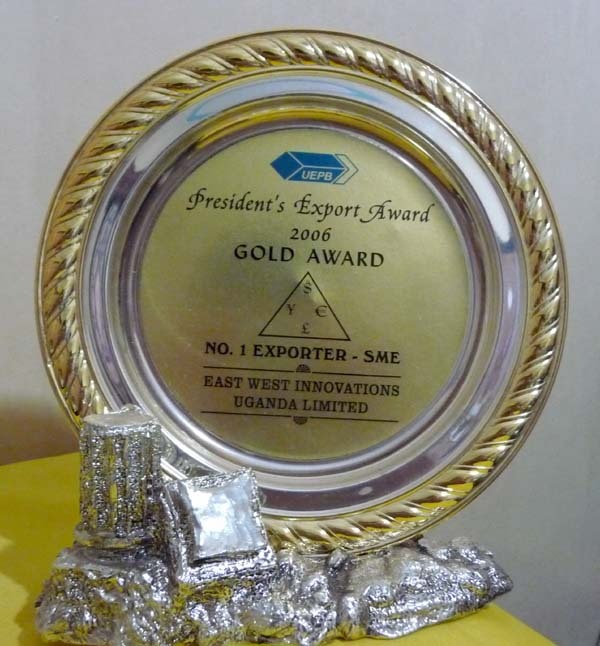 This time round, they will be setting up 2 rattan hives, 4 Kenyan top bars and 1 log hive coming from Gulu. After which, they were taught to bait all the hives before deploying them out into the field. 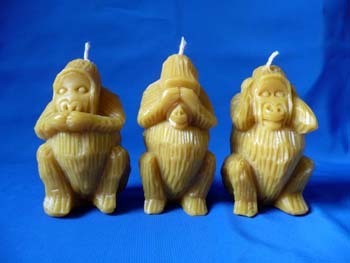 Baiting is an important process for it will hasten the process of colonization. 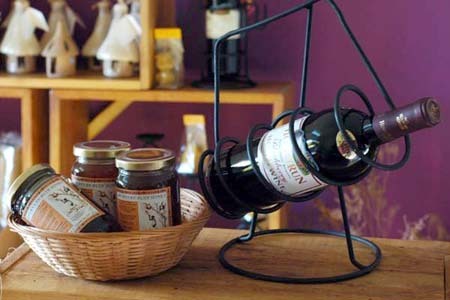 Many a times, farmers would use cassava flour or honey or even sugar, placed inside the hive to attract the bees. They did not realized that these items will also attract other insects like ants. Below are some of the shots taken during the 6 days training. 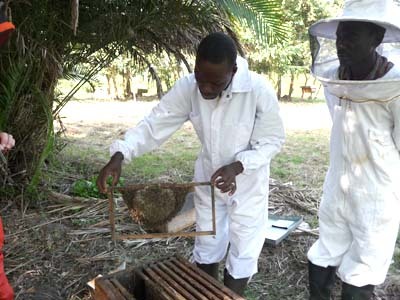 Team were divided to work on different hives. Karl's team working on Kenyan top bar. The rattan hive was covered with dried banana leaf as waterproofing. A combination of natural substance which the bees like were introduced to entice a colony to come. Rattan hive ready and in place. Ssali inspecting a brood comb. Traditional log hive made out of a palm tree. 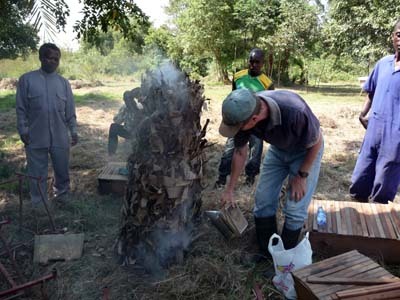 One of the lesson, making rattan hives. Rattan hives ready for coating. Last day of training - harvesting honey during the day. 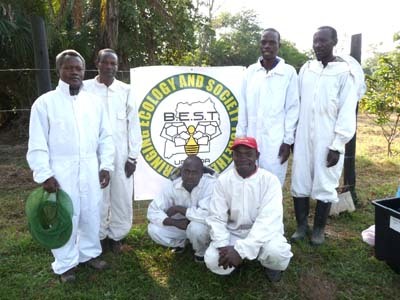 BEST bee farmers in Uganda. Earlier in this blog, I mentioned that we had an interesting participant. his name is David Sengaali. He was born physically challenged. His left hand was born stunted but his determination of being a good beekeeper was admirable. 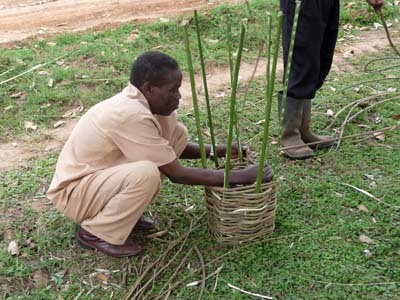 David preparing reed for the basic structure of his rattan hive. 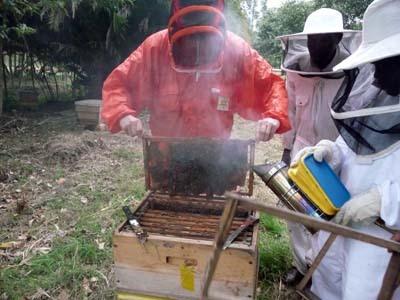 David started beekeeping when he was 9 year old and got his skill of honey hunting through his grandparent. 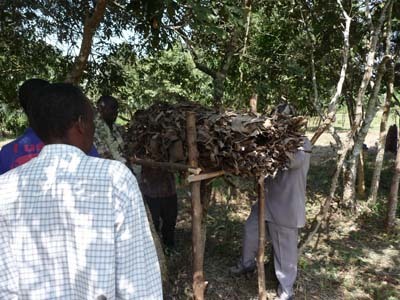 He would move around with them and other beekeepers in his village whenever they went for honey hunting. At the tender age of 9, he was fascinated by these insect and wanted to know more. Soon the desire to keep them was so strong that he started to build his own hive and caught bees in places like abandoned ant hill and hollow logs. He would then transfer them into his hives. Soon village folks around came to know about his passion and they started to buy honey from him. Honey is like medicine to these villagers. With that little source of income, he managed to send himself to school. 25 years had past and now he makes his living by making bee hives, smokers and bee suit for Organizations. His passion had turned into a business for him. He chanced upon our project 2 months back and was curious when he saw our apiary. He wanted to know more about our operation and approached Karl. When he heard that we are conducting training, he requested to join in so that he is able to increase his knowledge in beekeeping. My interaction with him found out that his knowledge in beekeeping was good. He does have potential in this trade. I will be monitoring him from now and I believe he will be a good candidate to be a future bee trainer under our wing. 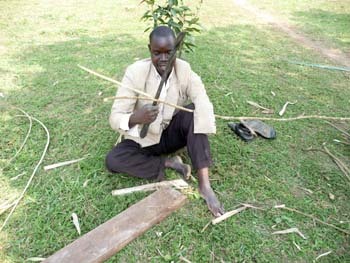 Below is a video of him making his own rattan hive during the training.